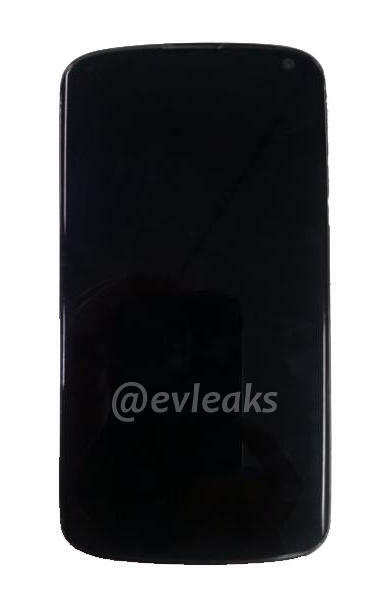 Famed image and spec leaker, @evleaks, dropped info on the upcoming LG Nexus 4 this morning, echoing info we have seen a number of times over the last few weeks. For those not familiar, understand that this Twitter account posts press images and spec details of devices well before they ever become official and is almost always spot on. Here is what we have. Again, none of this is necessarily new info, but we would assume that it was pulled from an online source that has final or close to final details. The name Nexus 4 was included, as was model number LG-E960. Mentions of the quad-core Snapdragon S4 Pro processor, 720p display, 2GB RAM, 8MP, and new version of Jelly Bean were also mentioned. The phone will reportedly carry a 2100mAh battery and as had been talked about previously, two options for internal storage: 8GB or 16GB. As far as the image above is concerned, you can tell that it has been cropped, probably to conceal its origin. It looks like the Galaxy Nexus, and the LG prototype that was pre-reviewed last week. The low storage limits are odd, as is the idea that this phone won’t have an LTE modem. I’m close to calling this a step backwards, but at the same time, if Google is making these two moves to keep the price incredibly low, then I can probably live with HSPA+ and 16GB of internal storage. I’m talking $299 for an unlocked, quad-core phone with 2GB of RAM. That would be a major win. I know that we have all become accustomed to LTE speeds, but if you can buy a new Nexus each year for $300 without being locked into a contract, isn’t that a deal? That is of course, all speculation. We should know exactly how it will go down after Monday, October 29 in NYC. Flight booked. Rovio's Hypebeasting of Angry Birds: Star Wars Continues, "Aren't You a Little Short?"